In February 1996, Pacific Gas and Electric Company (PG&E) entered into a voluntary agreement with the California Department of Toxic Substances Control (DTSC)The department within the California Environmental Protection Agency in charge of the regulation of hazardous waste from generation to final disposal. DTSC oversees the investigation and cleanup of hazardous waste sites. to further investigate the nature and extent of contamination at the Topock Project Site (Site) resulting from Topock Compressor Station (Station) operations and to clean up related contamination. This agreement, the Corrective Action Consent AgreementA voluntary agreement between a lead agency and responsible party in which the company commits to investigate the nature and extent of contamination at and surrounding a site governed by RCRA, and to take corrective action., and its 2018 amendment, requires PG&E to follow an investigation and cleanup process governed by a federal law known as the Resource Conservation and Recovery Act (RCRA)A 1976 amendment to the first federal solid waste legislation, the Solid Waste Disposal Act of 1965. In RCRA, Congress established initial directives and guidelines for U.S. EPA to regulate and manage solid waste, including hazardous waste. RCRA established a regulatory system to track hazardous substances from the time of generation to final disposal. The law requires safe and secure procedures to be used in treating, transporting, storing and disposing of hazardous wastes. RCRA was designed to prevent new, uncontrolled hazardous waste sites.. In July 2005, PG&E entered into a voluntary Administrative Consent AgreementA legally binding contract between a lead agency and responsible party that serves to resolve an environmental violation through an administrative settlement agreement rather than through a court action. with the U.S. Department of the Interior (DOI)The United States department charged with conservation and development of natural resources. The U.S. Department of the Interior uses sound science to manage and sustain America’s lands, water, wildlife, and energy resources, honors our nation’s responsibilities to tribal nations, and advocates for America’s island communities.. This Consent Agreement ensures compliance with federal requirements as set forth in Comprehensive Environmental, Response, Compensation, and Liability Act (CERCLA)Commonly known as Superfund, this law created a tax on the chemical and petroleum industries and provided broad federal authority to respond directly to releases or threatened releases of hazardous substances that may endanger public health or the environment. CERCLA established prohibitions and requirements concerning closed and abandoned hazardous waste sites; provided for liability of persons responsible for releases of hazardous waste at these sites; and established a trust fund to provide for cleanup when no responsible party could be identified. The law authorizes two kinds of response actions: Short-term removals, where actions may be taken to address releases or threatened releases requiring prompt response. Long-term remedial response actions, that permanently and significantly reduce the dangers associated with releases or threats of releases of hazardous substances that are serious, but not immediately life threatening..
PG&E agreed to conduct a RCRA Facility Investigation/Remedial Investigation (RFI/RI)An investigation that occurs in the corrective action process following a Facility Assessment under RCRA and/or a Site Inspection under CERCLA. It is an in-depth study designed to gather data needed to determine the nature and extent of contamination at a site. to determine the extent of contamination and potential impacts to human health and the environment, and to gather information to support the evaluation and selection of remedies to address the contamination as necessary. RFI/RI data collection activities started in 1996. 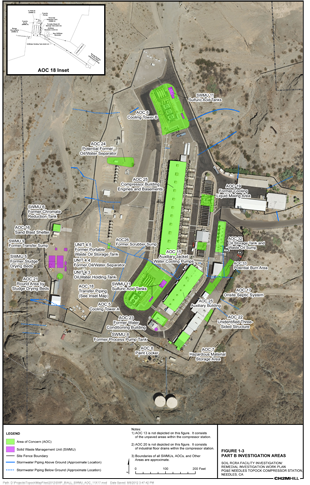 There have been multiple phases of investigation at the Site to collect data to evaluate the nature and extent of soil contamination at the Solid Waste Management Units, Areas of Concern, and Undesignated Areas. 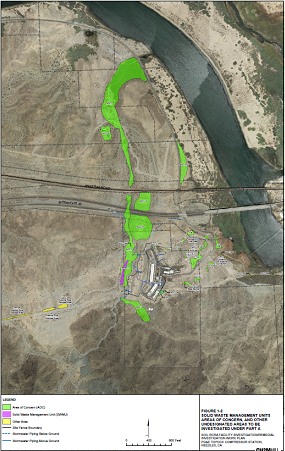 There are 15 soil investigation areas located outside the Station fence line (see figure below) and 27 soil investigation areas located inside the Station fence line (see figure below). The perimeter area outside of, but adjacent to, the Station fence line and the storm drain system were also investigated during the soil investigation. Collection of soil samples at 364 locations. Trenching of 15 locations to evaluate possible contamination. Collection of sediment and pore water samples from 10 locations at the edge of the Colorado River by the East Ravine. After sample collection was completed, results were evaluated by DTSC, the U.S. Department of the Interior (DOI), and PG&E to determine if additional data collection is needed to complete the Soil Investigation and evaluate potential next steps. The agencies and PG&E balanced the data collection necessary with Tribes request to minimize site intrusion by maximizing the use of archived samples and collection of samples from existing locations. On June 20, 2017, DTSC and DOI determined that the Soil RFI/RI field work was completed and concurred with PG&E to move forward with the risk evaluation process per the approved Risk Assessment Work Plan and addendum. In addition, PG&E will commence the preparation of the RFI/RI Volume 3 report. Volumes 1 and 2 are discussed in the Groundwater Cleanup – RCRA Facility Investigation/Remedial Investigation pages. The Volume 3 Report will include the final soil characterization results (including a soil risk assessmentA study prepared to assess health and environmental risks due to potential exposure to hazardous substances.) to complete the RFI/RI requirements for the Site. The first phase of soil investigation in areas outside of the Station was completed in 2008. Soil data have been reviewed, and data gaps have been identified. A Draft Soil RFI/RI Work Plan, which describes the additional data needed to address the identified data gaps at the Site, was prepared and submitted on May 6, 2011. A revised Soil Work Plan was submitted on January 14, 2013, which proposed additional soil investigation for all areas of the Site. Pursuant to the California Environmental Quality Act (CEQA), DTSC evaluated the environmental impacts associated with the soil investigation in the Final Soil EIR. DTSC filed a determination and certified the Final Soil EIR on August 24, 2015 along with the approval of the Final Work Plan. DOI also approved the Soil RFI/RI Work Plan on August 24, 2015. PG&E began the soil field investigation on October 29, 2015 and completed it in April 2017. The Soil RFI/RI Report is being prepared and is anticipated to be completed in 2019. RFI/RI Volume 1 and 2 (and its addendum if applicable) can be found in the Information Repositories and the Document Library. RFI/RI Volume 3 will also be made available to the public when completed. To guide decisions based on potential risks to human and ecological health at the Site, PG&E prepared comprehensive Human Health and Ecological Risk Assessment Work Plans for soil. The Risk Assessment Work Plan was submitted on August 25, 2008. An addendum was submitted on February 4, 2009. On September 19-20, 2013, DTSC, DOI, PG&E, and Tribal Nations met to discuss amendments to the Soil Risk Assessment Work Plan. A Risk Assessment Work Plan Addendum II was submitted on May 7, 2014, and contains updated information relevant to soil risk assessment activities and evaluation based on comments received by Tribal Nations, agencies, and stakeholders. The Final Human Health and Ecological Risk Assessment Work Plan Addendum 2 was submitted on June 29, 2015. DTSC conditionally approved the Soil Risk Assessment Addendum II on August 31, 2015 (clarified on September 15, 2015) and DOI conditionally approved the Addendum 2 on September 8, 2015. With the completion of the soil investigation in April 2017, and with DTSC's concurrence on June 20, 2017 to proceed with the soil Risk Assessment, the Soil Risk Assessment is now being prepared by PG&E. The risk assessment will provide information about potential human health threats and ecological risks posed by affected soil, and assist risk management decision making on the need for soil remediation. The Soil Risk Assessment is anticipated to be completed in 2018. Currently no pilot studies are planned for soil cleanup and remediation. If soil investigation and risk assessment determine that soil cleanup is necessary, PG&E may conduct pilot studies and tests to evaluate the various remedial technologies for the soil cleanup in the future. The Site is contained within a larger geographic area that is considered sacred by the Fort Mojave Indian Tribe and by other Native American Tribal Nations. In the 2011 Final EIR, DTSC concluded that the 779.2‐acre Site “appears to qualify as a historic resource under CEQA as an area that is significant in the social and cultural annals of California,” and the U.S. Bureau of Land Management (BLM) also has determined that a traditional cultural property or property of traditional religious and cultural significance that is eligible for listing in the National Register of Historic Places exists in the area of the Topock Project, within the current Area of Potential Effect, consisting of 1,600 acres of surface area and a section of the Colorado River. Among the larger and better known cultural resources on the Site is an expansive desert geoglyph or intaglio, known as the Topock Maze. For these reasons, all activities at the Station are planned in such a way as to minimize impact to this area. Impacts to cultural and archaeological/historical resources will be minimized by implementing the mitigation measures required by the Programmatic Agreement and the Cultural and Historic Properties Management Plan, and in consultation with Tribal Nations throughout the investigative activities. A large portion of the Site and surrounding area is the Havasu National Wildlife Refuge. Portions of the Site are also located in a Riparian and Cultural Area of Critical Environmental Concern and the Topock‐Needles Special Cultural Resource Management Area, designated under the BLM Resources Management Plan. Impacts to biological resources will also be minimized by implementing management measures required by the Programmatic Biological Assessment (PBA) and the Avoidance and Minimization Measures required by the California Department of Fish and Wildlife. PG&E has also worked closely with biologists to ensure appropriate measures are taken to protect sensitive desert habitat during all aspects of Project implementation. A PBA was completed in January 2007 to cover remediation and investigation projects at the Site up to the final groundwater remedy. On December 27, 2012, the 2007 PBA was modified and extended for 5 years (until 2017). Authorization for the extension and modification of the 2007 PBA can be found here. A new PBA was submitted April 28, 2014, and covers activities related to implementation of the groundwater remedy. The 2014 PBA can be found here. For habitat improvement, mesquite trees were planted on the Havasu National Wildlife Refuge and a drip irrigation system was installed to ensure their survival.